How can I fix a hole in a hollow wooden door? 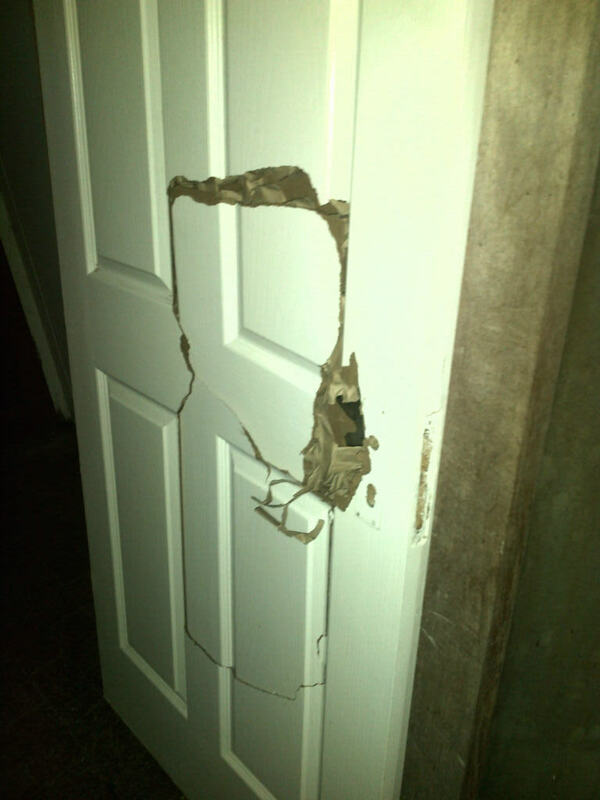 Recently the lock in my wooden door failed and the only way to open the door was to "motivate" the lock. Unfortunately the door was hollow and I ended up putting my foot through it. Now, rather than buy a new door and use the old one as firewood. I would like to know the best way to fix it. The problem I face is that the outer shell is quite thin with the only real wood being on the sides. I am going to need to figure out a way to "re-cover" the door and get the bits and pieces back in place. Not worth the time and effort. Replace the door. Not the answer you're looking for? Browse other questions tagged doors door-frame or ask your own question. How can I fit a Schlage lockset in my front door? How can I fix a hairline crack in a thin wood panel of an exterior door? How do I fix a hole in a hollow door? How to add insulation to a hollow core exterior door? How can I open a locked door with a half destroyed cylinder lock?